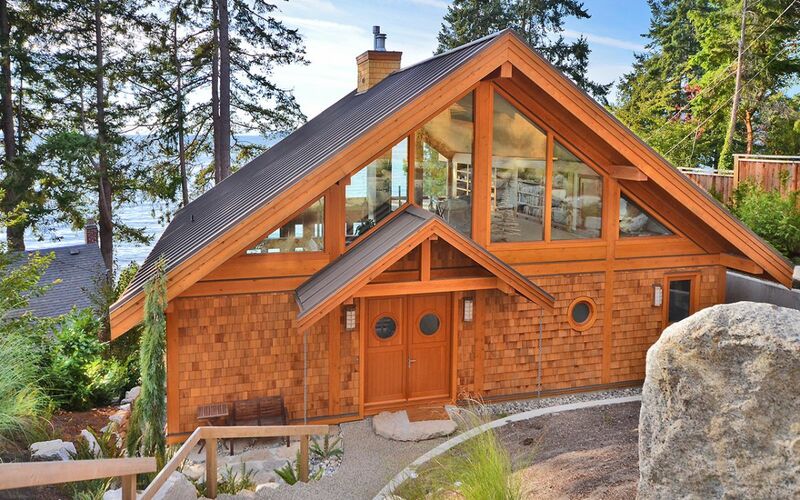 They say a picture is worth a thousand words, and we were certainly silenced in awe upon seeing this gorgeous log home. 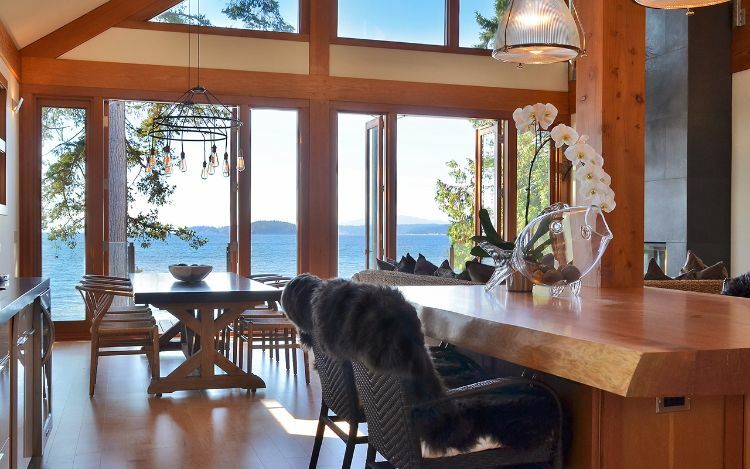 The attractive facade gives a lot of privacy from those approaching, while the huge glass windows in the roof space show us what awaits beyond the door: a spacious open, airy floor plan which looks out over the water - stunning! 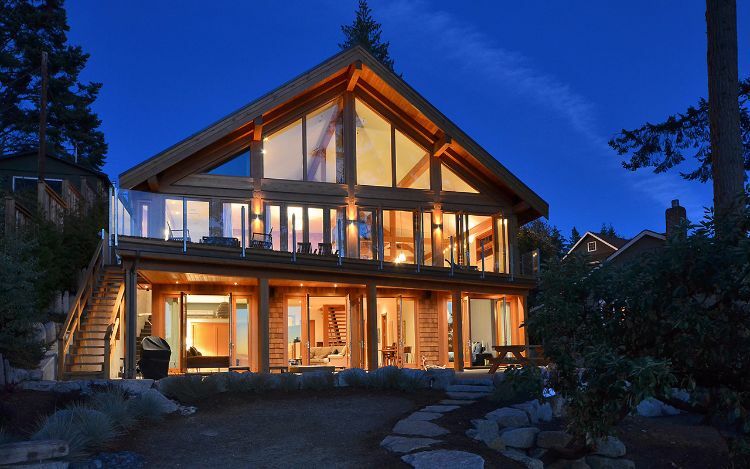 David Bay is a modern timber-frame home, constructed in 2011 by West Coast Log Homes. It is located in Sechelt, BC, with postcard views over the Strait of Georgia out to Vancouver Island. 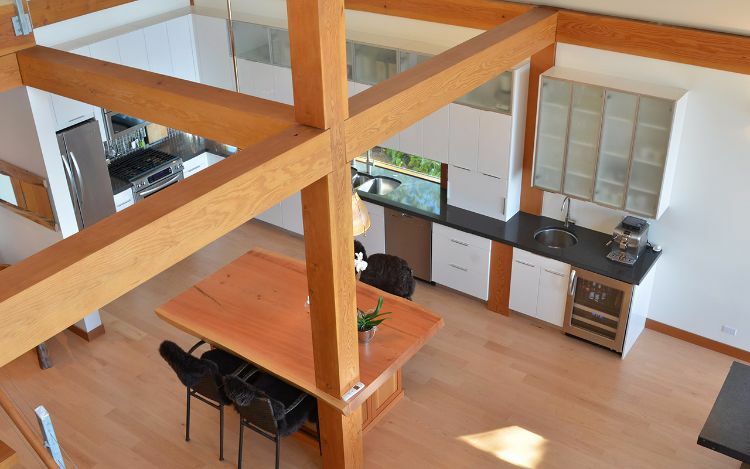 This log home has a three-bedroom floor plan with a sleek, contemporary interior which maintains the ethics of rustic living. Entering via the front door with cute round windows, we immediately discover the dazzling kitchen. The use of white cabinets with stainless steel appliances makes this room shimmer in the sunlight. The tall cabinetry makes full use of the cathedral ceiling. 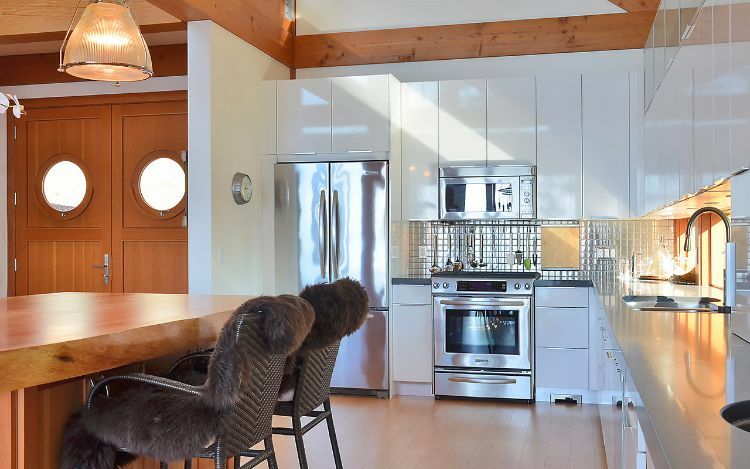 The main living level of Davis Bay has an open concept, featuring a kitchen, dining set, and comfortable sitting area. 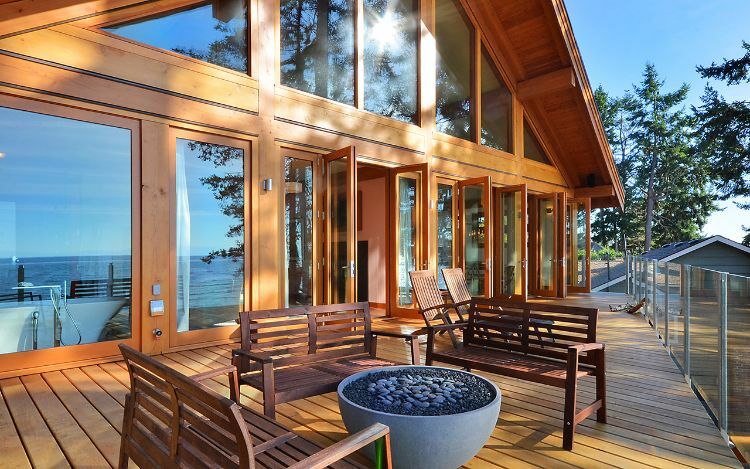 Multiple glass doors give your home life a simple flow for indoors/outdoors living. The irregular-shaped terrace has a deep section which comfortably houses outdoor furniture and a firepit. 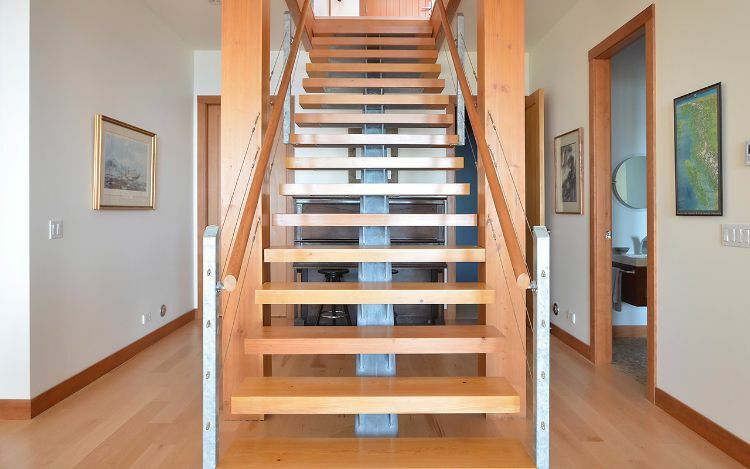 The home is built with fir beams, which have a warmer tone in comparison to the wood we usually see. This softer palette contrasts nicely with the brilliant-white kitchen cabinetry and overall minimalist theme of the house. 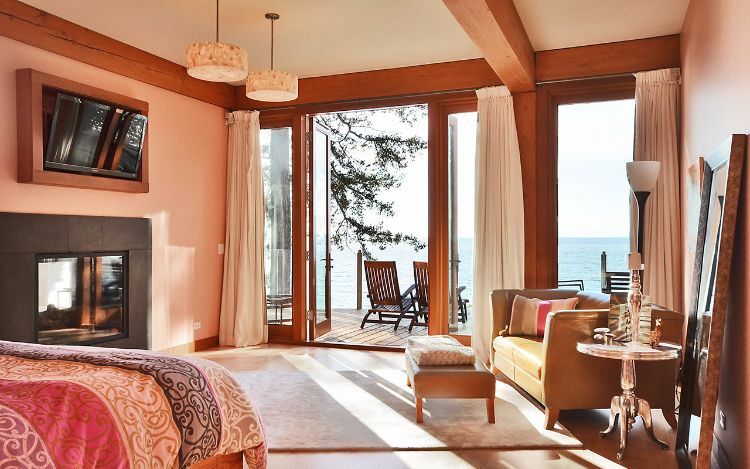 Davis Bay has three bedrooms; the master is located on the main living level and continues with the same theme of open space overlooking the water. Each bedroom is as tastefully furnished as the rest of the house, with high-quality finishes and detailing throughout. We transition downstairs to find a second sitting room, more bedrooms, and bathrooms. 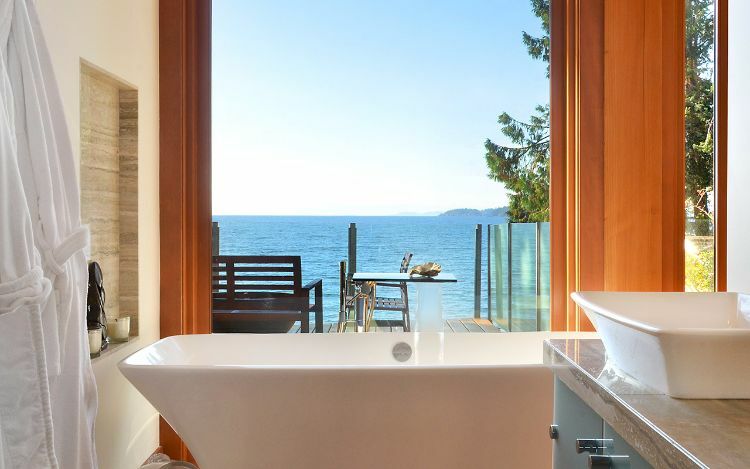 This bathroom is a work of art; the tub oozes state-of-the-art design standards and has outstanding views of the blue waters. It doesn't get much more relaxing than this! Davis Bay looks beautiful at night lit up in all its splendor - what a house! Share this tour on Facebook; let your friends see inside this gem!